According to the Israel Cancer Association, there were 21,155 breast cancer survivors and newly diagnosed breast cancer patients between 2008 and 2012. Hadassah, with its multidisciplinary, personalized approach to the disease, is developing therapies and reaching out to new communities for research and treatment. Nor does a BRCA mutation solely affect the patient, she says. Each first-degree relative has a 50-percent chance of carrying that mutation. The patient must decide whether and how to tell them. So screening must be part of oncogenetic counseling in which the consequences to the woman and her family are addressed. Dr. Tamar Sella, head of the Greenebaum center, examines a patient. Photo by Alon Tuval/courtesy of HMO. Dr. Kadouri has been active in genetic counseling and risk assessment in breast and ovarian cancer since the Clinic for Oncogenetic Counseling opened in 1995 in the Sharett Institute. She also works for the Center for Malignant Breast Diseases’ Risk Evaluation Program, counseling patients together with a medical oncologist. “In the general population,” she says, “we test for dozens of cancer genes, but in Jewish patients we begin by checking for the mutations we know are common among them.” With Dr. Peretz and collaborators from Hadassah’s Department of Genetics and Metabolic Diseases, she has found BRCA mutations specific to Jews of Yemenite and Kurdish origin. 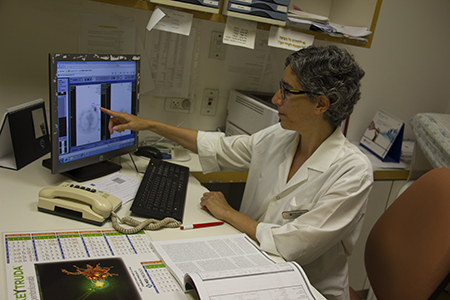 The team is currently investigating BRCA in Israel’s North African Jewish and Palestinian populations. Israel’s high rate of BRCA mutations has attracted international pharmaceutical companies seeking to prevent or mend the damage wrought by the faulty gene. One promising approach is PARP inhibitors that block an enzyme in cancer cells. Clinical trials of this new type of targeted therapy are underway at Hadassah. Although breast cancer kills some 900 people in Israel each year, survival rates are increasing. The International Agency for Research on Cancer ranks Israel fifth highest in incidence of breast cancer, but only ninth (and declining) in mortality. This is largely explained by the increase in early detection. Outreach to heighten awareness of breast exams began in the mid-1990s with immigrants from the former Soviet Union. It now extends to other communities as well, especially those neglectful of breast health. Dr. Luna Kadouri has been active in genetic counseling for breast cancer since 1995. Photo by Alon Tuval/courtesy of HMO. “I remember talking to newly arrived Ethiopian women and showing them how to self-examine—most with a baby tied to their backs,” says Ilana Kadmon, Ph.D., Israel’s first clinical breast-care nurse specialist and today a senior faculty member at the Henrietta Szold Hadassah–Hebrew University Nursing School. The proportion of Arab women undergoing biennial mammography—covered by Israel’s health care system for women over 50—has risen from 49 percent in 2001 to 70 percent today. Hadassah also has targeted ultra-Orthodox women, where outreach coordinators made an unexpected finding: Incidence of breast cancer is lower among haredim than in the general community, but patients present at a younger age and a more advanced stage. Israel’s multiethnic society propels Hadassah Medical Organization’s genetic oncology approach, which tailors therapy to individual patients according to genetic profile. This emphasis on the individual meshes with the way HMO supports breast cancer patients. 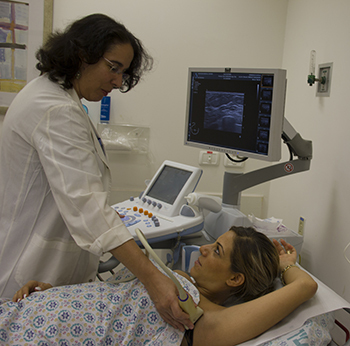 The five-year-old Marlene Greenebaum Multidisciplinary Diagnostic Breast Center at Hadassah–Hebrew University Hospital at Ein Kerem is a single, rapid access point to biopsy, ultrasound, radiation, consultation, treatment and follow-up. “In breast cancer, there are a lot of difficult moments and a lot of hope,” says radiation oncologist Dr. Tamar Sella, head of the Greenebaum center. HMO introduced not only the breast-care nurse specialist to Israel, but also the discipline of psycho-oncology. Lea Baider, Ph.D., joined the Sharett Institute in 1979 as a senior psychologist and within a decade set up a dedicated Psycho-Oncology Unit. Today, at the age of 76, the Hebrew University professor emerita of psychology volunteers in the unit. “The level of psychological distress and ability to adjust to a diagnosis of cancer are highly variable,” she says. In addition to treating thousands over the years, Baider has examined how cancer patients cope with the trajectory of their illness as well as the influence of gender, marital status and spiritual beliefs in families struck by cancer. 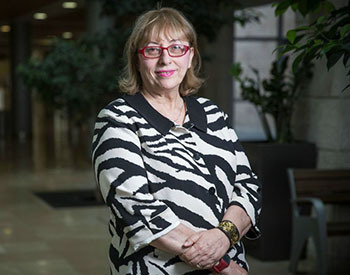 She has carried out groundbreaking research—“the most focused and comprehensive ever to be conducted in the field,” says Dr. Peretz—into the response of Holocaust survivors and their families to a breast cancer diagnosis.